After eight years of services and experience in the hotel and tourism sector, our first hotel has given a birth to another star-rated hotel Bahir Dar Hotel 2. The newly built, Bahir dar Hotel 2, is located in Kebele 05 adjacent to east of St. George Church traffic light, which is a good location at the heart of Bahir Dar city (down town). Every popular attractions, recreation centres, shops, lakesides, and transport links are within a walking distance from Bahir Dar Hotel 2. 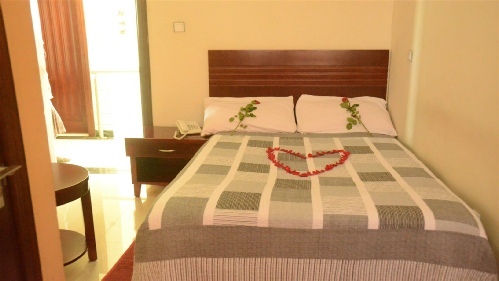 Bahir Dar Hotel is providing a complementary service with reasonable prices. Restaurant and bar: casually elegant food and beverage program under the supervision of Executive chef. We’ll definitely be back soon! Enjoy a traditional Breakfast cooked fresh every morning by our award chef. Free Wi-Fi is available in both the individual rooms and in the reception/bar areas. All of our beds have luxury foam mattresses. Guaranteed for a good nights sleep! Our on-site car park entitles all our guests to totally free parking for the duration of your stay. We boast a fully licensed bar, perfect for a drink at the end of a great day! We are proud to say we have won multiple awards for both our facilities and food services.